The leading air carriers of Russia and Vietnam have agreed to strengthen cooperation between the two with a codeshare arrangement. 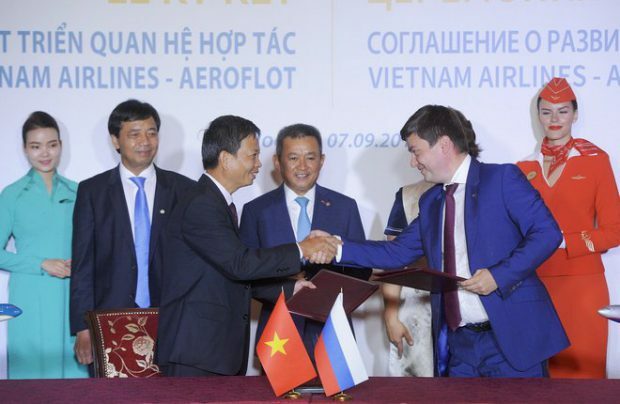 Aeroflot and Vietnam Airlines signed a special Memorandum of Understanding (MoU) to strengthen the ties between the two aviation leaders. This MoU indicates that starting in 2019 the airlines will codeshare on domestic routes in Russia and Vietnam and also be expanding their cooperation over several areas of business. Aeroflot operates nine flights per week on routes between Moscow and Vietnam with a daily flight to Hanoi and a twice-weekly service to Ho Chi Minh city, utilizing Airbus A330 and Boeing 777 aircraft. Vietnam Airlines offers three direct flights per week between Hanoi and Moscow, operated on Boeing 787-9 aircraft.